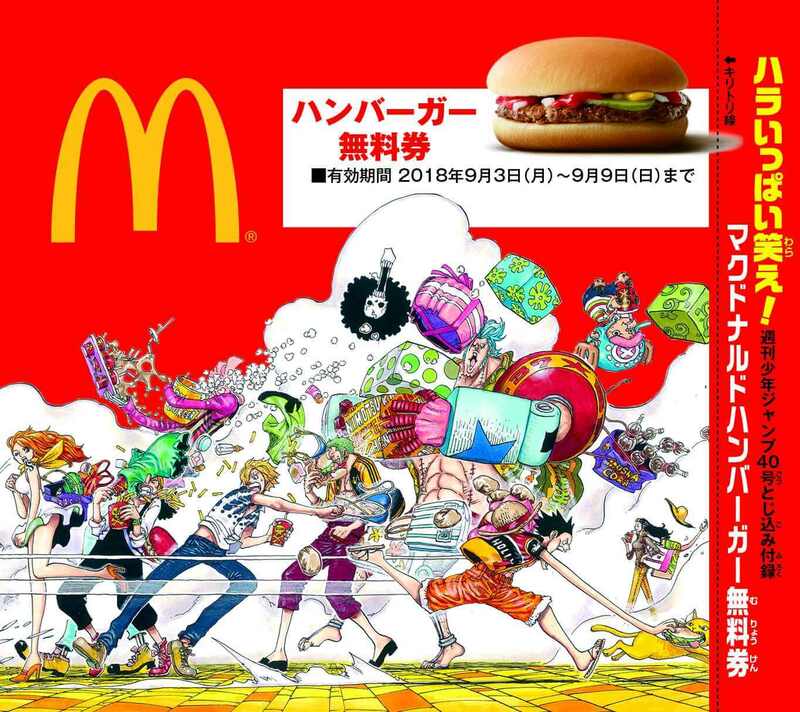 Weekly Shonen Jump, a weekly manga magazine that serialises popular series like One Piece and My Hero Academia, is teaming up with McDonald’s to hold two collaborations that will run from August 28 to September 9. The first is getting your hands on volume 40 of Weekly Shonen Jump which releases on September 3. It comes with a voucher for a free hamburger at McDonald’s. Simply present your voucher at any McDonald’s branch in Japan by September 9 and tuck in! 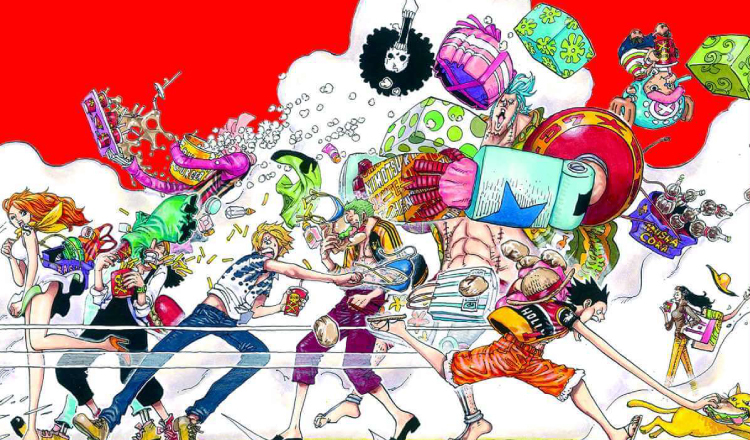 The second bonus is getting to read a 1,000 page Jump volume for free. 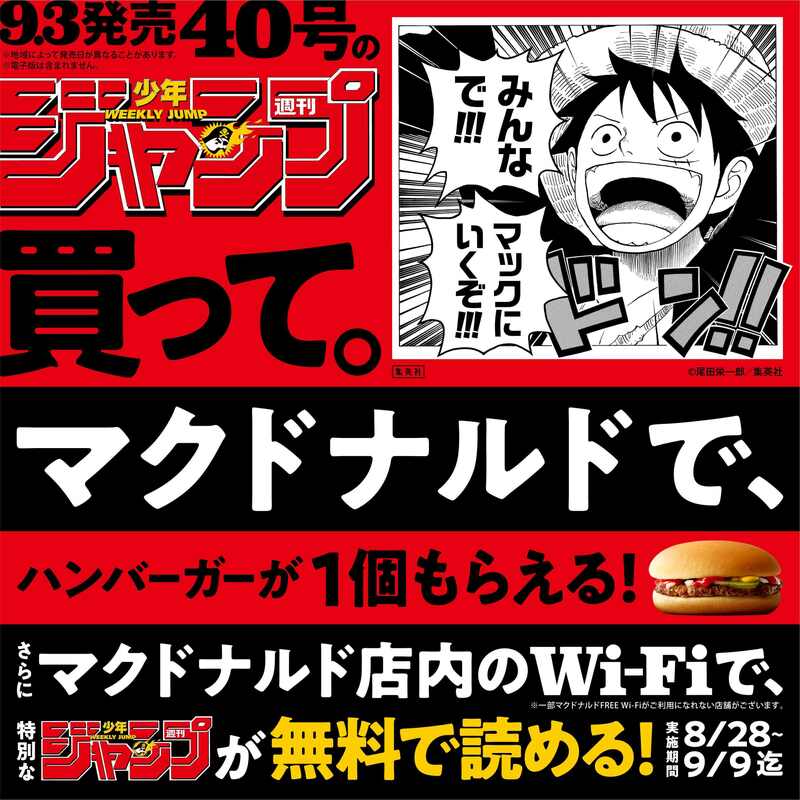 Connect to any McDonald’s free Wi-Fi with your smartphone or tablet and open the Shonen Jump+ manga magazine app. You can do this right now and it is available until September 9. Don’t miss out on this very special collaboration. Voucher: Valid from September 3, 2018 at 10:30am to September 9, 2018 at 11:59pm. One free burger per voucher. Available: At approximately 2,900 McDonald’s branches in Japan. Available: Via McDonald’s free Wi-Fi at approximately 2,900 McDonald’s branches in Japan. *Read individual chapters or subscribe to digital Weekly Shonen Jump series. *Digital Weekly Shonen Jump price subject to change without notice.